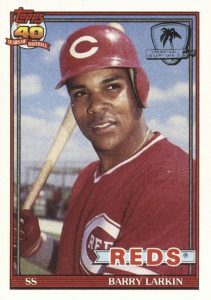 Barry Larkin was the anchor of the Cincinnati Reds infield at shortstop for nearly two decades, winning a National League MVP award and leading the franchise to its only World Series crown since the days of the Big Red Machine. 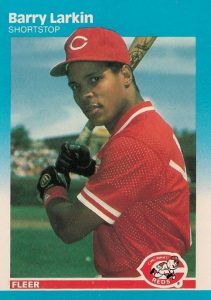 Some of the best Barry Larkin baseball cards from his playing days and beyond are documented below. 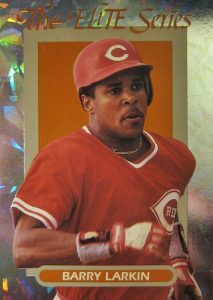 Larkin was the top baseball prospect to ever come out of the University of Michigan and he was selected by the Reds in the first round of the 1985 draft. Larkin spent very little time in the minors before establishing himself at shortstop with Cincinnati. He would develop into the best hitter at the position by winning nine Silver Slugger Awards over his career. While Larkin also won the 1995 NL MVP award, his 1996 season was even better. As the first 30-30 shortstop in baseball history, he hit 33 home runs and stole 36 bases. Larkin retired in 2004 after 19 seasons and was elected to the Baseball Hall of Fame in 2012. 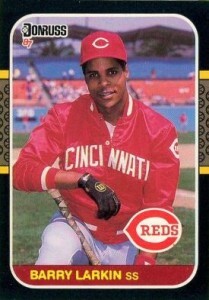 Shop for Barry Larkin autograph cards on eBay. A standout at Michigan, Larkin was twice named Big Ten Player of the Year, with the Wolverines also making two College World Series appearances. For fans wanting to collect Larkin in his Michigan uniform, look to 2013 Panini USA Champions, 2015 Panini Contenders, and 2016 Panini Flawless. The Flawless set features an autograph that has images of Larkin from college along with his time for Team USA. Other notable Larkin cards include an 11-card set, produced by Star, that was devoted specifically to him. 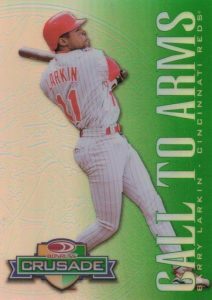 In addition, Larkin also has a memorable card in 1997 Topps that features him sliding into second base. The impressive image shows Larkin beating the tag of Chicago Cubs infielder Rey Sanchez with Wrigley Field's ivy-covered walls in the background. 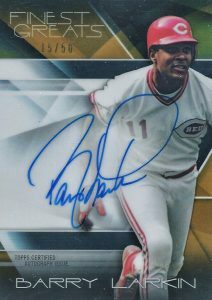 In 2016 Topps Tier One, Larkin is combined with another great Cincinnati Reds infielder, Brandon Phillips, on a beautiful dual autograph. Barry Larkin's career demonstrates how being a team leader and complete player can earn you a trip to Cooperstown. Helping his cause, he avoided the suspicion of steroid use, which is common amongst players of his era. In arranging this list, card value was the key factor as well as card design and availability to collectors on the secondary market. Included with the company's hot dogs and wieners, the original series of Kahn's baseball cards were released from 1957 to 1969. Those sets concentrated on teams from Ohio and Pennsylvania with the focus being on the Reds and Pittsburgh Pirates. After nearly two decades away, Kahn's got back into the baseball card game in 1987. A 26-card set was available to fans who attended the Reds game against the San Francisco Giants on August 2. Larkin's early card is the highlight of the set, along with manager Pete Rose's card. 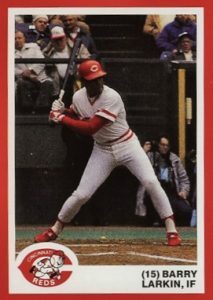 Although there are only 20 cards in the 1993 Donruss The Elite Series set, Larkin's card is marked as card #23. This discrepancy is due to the fact that Donruss continued the numbering system used in 1991 and 1992 Elite, which were small sets of 10 and 12 cards, respectively. Limited to 10,000 copies per player, Elite Series was one of the few sets of its day to serial number each individual card. Donruss' answer to Topps Chrome came in the form of the Donruss Crusade cards released across several 1998 sets. Forty cards were issued in 1998 Leaf, 40 were included in 1998 Donruss, 30 cards in 1998 Donruss Update, and a final 30 cards were in 1998 Leaf Rookies & Stars. The base color of the Crusade set was green, featured below, and was limited to 250 copies. Other parallels included purple, limited to 100 copies, and red, which had a scarce 25 copies for collectors to fight over. Many of Larkin's earliest certified autographs, including his first overall in 1997 Donruss Signature, are hard to find on the secondary market. Collectors have a better chance in locating a Larkin autograph in more recent sets, including his Finest Greats autograph from 2015 Topps Finest. The Finest Greats autograph insert includes 16 Hall of Fame members with numbered gold, orange and red parallels to pick up. Larkin's signature is often positioned at an upward angle with the loops in the "B" and "L" dominating the entire composition. Of the three key Larkin rookies on this list, the 1987 Donruss version is the only one that is not part of a limited-edition format. While making it more accessible, it also means the card is not as popular or valuable. Larkin's rookie season in 1986 was promising with a .283 average over 41 games. Given this production, it is a bit surprising that Donruss didn't make Larkin a Rated Rookie in their 1987 set. 2016 was the 25th anniversary of 1991 Topps Desert Shield and the famous gold stamping was included as a rare insert in 2016 Topps Archives. Larkin has two cards in 1991 Topps including the base card featured below and an All-Star card placed at #400 on the checklist. Both cards can be found with the palm tree stamp in the upper corner, signifying that it was made expressly for service men and women involved in the Desert Shield operation. 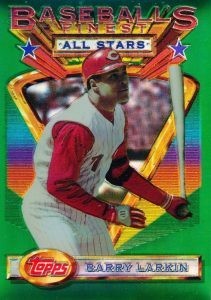 The 1993 Finest set featured 199 cards with 33 players in the All-Stars subset, including Larkin's card below. Those All-Star cards were also made into larger box toppers that could be found as a bonus in each box of '93 Finest. Larkin made 12 All-Star teams over the course of his career, including 11 appearances out of 13 seasons between 1988 and 2000. While the base Refractor parallels total roughly 250 copies, the oversized box toppers are more plentiful at an estimated 1,500 copies. 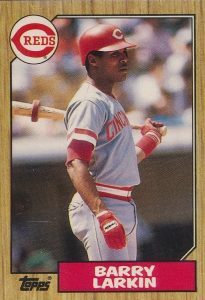 Larkin spent so little time in the Reds farm system that no minor league or pre-rookie cards exist for him. Instead, fans can find the key pre-rookie card for Larkin in 1986 Sportflics Rookies. The 50-card set featuring Sportflics' unique 3-D cards was their answer to the popular Topps Traded sets. Larkin's appearance is not considered a true rookie because the set was only issued at hobby shops or via mail order from Sportflics. Fleer tried something new in 1987 by issuing a glossy version of their flagship set in response to Topps Tiffany. The sets came to collectors in metal tins and each tin was numbered on the outer plastic wrapping. This means the product would lose that numbering forever once the tin was opened. As roughly 100,000 sets were produced, they were not as rare as the Tiffany sets. 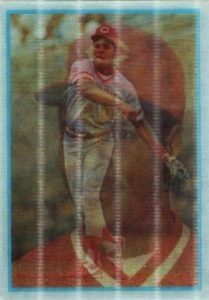 However, Fleer Glossy still provides a nice alternative to the extreme overproduction of the period. Although never confirmed by Topps, it is estimated that about 30,000 Tiffany sets were produced in 1987. That is roughly a third of the production level of 1987 Fleer Glossy, making this version of Larkin's rookie card the hardest to locate. The reverse side of the 1987 Topps card highlights Larkin's success in the minor leagues where he played for the Vermont Reds and Denver Zephyrs. Larkin's Tiffany card is a great place to start a Hall of Fame rookie collection as mint-grade copies can still be found at reasonable prices.